This is a real ad, found in one of those FREE Employment Weekly newspapers shelved by grocery store entrances and exits. Though I am employed, I grabbed one a couple of months ago just to see what was what. I mean, this is Cleveland, Ohio. The economy isn’t exactly booming. Masses are unemployed. And if not unemployed, than underemployed. Meaning they are working several part-time jobs and/or whatever they can find to make ends meet. Cleveland’s economy has been somewhat depressed—the fallout being many ‘depressed’ people. Is it good form to dope them up? Offer them drugs? After I got over my shock, I thought of rounding up the family and friends to get in on this. Like, maybe we could call up and schedule to go in together. We could line up for our fix, then kind of hang out and be strung out together. It wouldn’t exactly be Hilton Head, but some might call it a vacation. The Clinical Pharmacology Unit is a self-sufficient, ~10,000 square-foot, 39-bed facility located less than one mile from a hospital emergency room and approximately one city block from an emergency response team. The Clinical Pharmacology Unit can house clinical study participants for weeks at a time, and it provides laundry facilities, a recreation area, wireless internet, and bedrooms with cable television. Meals are catered by a local vendor, and a dietician is available for specialized diets. To those without jobs, unable to pay their rent, put food on the table—sort of sounds like a country club, or at least free food and shelter. Maybe even a vacation. Or at least a vacation from reality. And so I might be a really good candidate for this medical experiment. I could snort what they passed to me. And walk away without wanting to head back for more clinical trials. After I worked through the shock, then laughed (a lot), I got a bit angry. Not because this place exists. I think we all understand the need for medical studies, in order to cure disease. Pharmaceuticals must be tested before being prescribed to the general public. And though it isn’t hard to make a case against this type of testing—or even against any/all pharmaceutical testing—those who have a child fighting cancer, or a loved one who is alive because a new treatment option became available in time to help will argue the other side. I was more offended by the marketing strategy than the overall concept. Because the ad was in a publication (likely non-profit) dedicated to helping people find employment, it seemed predatory. I’m sure for $3500, many made that call. 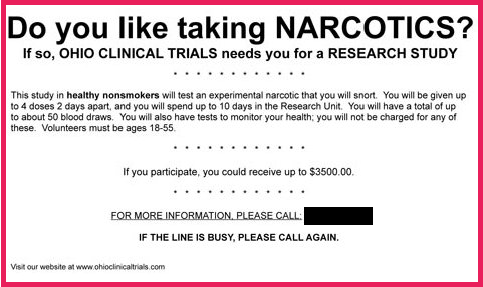 This entry was posted in Deep Thoughts and tagged clinical trials, medical research, narcotics by Amy Lauria. Bookmark the permalink. Haha…I didn’t much like science in school–but maybe if I did a ‘study’ I could like it as an adult? I see you deleted my replies informing you of the truth behind this ad, and of this study itself. If you want to remain ignorant, then fine that is your choice, but after I enlightened you about this subject, it is DISHONEST to either delete my replies or keep this post online. I’m sorry the truth does not fit into your world view, or makes you uncomfortable, but that is no reason to spread misinformation and lies. I know you find the ad to be offensive, but I will share my 2 cents that may (or may not) shed some insight on the purpose of the ad. While it seems a little predatory, it is placed that way for a specific reason. The news has been rampant with robberies and stories of crimes committed by people addicted to drugs. If you are desperate, and in pain from withdrawl the ad is suppose to sound better to you than breaking into someone’s home and stealing their property to obtain drugs. Also, due to the state and federal crackdown on prescription drug abuse, the drug makers are now faced with the challenge of finding new medications that are safe, effective, and non habit forming. Daunting task. Pain is subjective, it cannot be seen on a test. They are offering the hotel like setting, so the patient may detox from previous medications, conditions that require the medication can be safely monitored, and the patient can try the new medication formula in a safe, controlled environment. No you are completely wrong. The screening process weeds out any addicts, thoroughly I may add. This is a regular phase 1 clinical drug research study, same as for any medication being put on the market, narcotic or non-narcotic. The reason they are seeking people with past opioid use is that they are testing drugs that reduce pain without giving you an euphoric high, so they need people that can handle the narcotic and like the high the narcotic gives, so they can subjectivity say if they are getting any enjoyable night from the research dose. It is not a treatment or clinic for addicts. Actually, 90% of the people in these narcotic studies have never even abused a narcotic, only lied to get in the study to make the stipend. Since they weed out the addicts, there is only a VERY small demographic left that meets then requirements of liking to OCCASIONALLY use opioid, never been addicted to anything, and willing to be locked up and tested of for weeks at a time. Hope this clears things up for you. Also, see my other reply to this post. I’m actually in a similar study at this very facility right now. Literally sitting in the john reading this. It is a 4 week study where I will be paid a stipend of $9,000. I am in between jibs right now, so this couldn’t have come at a better time. They are researching combinations of opioids and non-opioids that are good at curbing pain without the euphoric high. Their goal here is NOT to get people high, and addicted to these drugs. This is the first study I have ever volenteered for, and being here I have met lots of people that travel the country doing phase 1 healthy subject drug studies. These seem to love this way of life, are happy and make a decent living, affording to travel the country and make money doing it. As far as their advertising goes, I see nothing wrong with it and am thankful that I saw the commercial on television. I had an enjoyable time and am going home tomorrow with 9 grand to pay some bills. If I were 10 years younger with no kids, I my try this out for a few years, touring around doing these studies, seeing the country. Great information, Nick. Thank you for shedding some light! !